"OK, here we go. The first three characters, in case you haven't recognized them by yourself yet, are 'To' - 'te' - 'do' ('Tang' - 'shou' - 'dao' in Chinese), 'Chinese' - 'hand' - 'way', in other words Tode-do, the old name of karate-do. The three next characters are Chung Do kwan ('qing' 'tao' 'guan' in Chinese, 'guan' being 'kwoon' in Cantonese and 'kan' in Japanese, as in 'Shotokan', Bujinkan', etc.) and mean Green Wave school (in Chinese, 'guan' actually refers to a building with only one or two floors but a very large surface. Didn't know how to translate that, so I chose to translate contextually as 'school', since it's often used as a metonymy for a school or style in Japanese). The next three characters mean 'the [N]th time' ('di [N] hui' in Chinese, don't know how to pronounce them in Japanese). The next character is unknown to me (sorry), but the next one ('cha' in Chinese, Japanese pronounciation unknown) suggests me that the two together might mean 'examination' or something like that. The next one ('hui' in Chinese) means 'meeting', 'gathering'. The last two characters ('ji nian' in Chinese) mean 'keep record', 'keep memory' (I must confess I had to ask my beloved for this one ). To sum it up:'record of the [N]th (examination?) meeting at the Green Wave dojo' ([N] being 3, 5, 7, 2 in that order)". 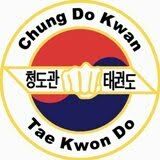 So the above photo is a photo to commemorate the third promotion examination at the Chung Do Kwan. The other numbers in his quote are from other photos he saw which I have not posted yet. 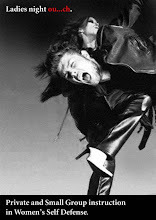 "You were doing so well I thought you should carry on. However the problem with translating single words only in any language has pitfalls. But generally you are right most of the time. It is obvious different generations of Koreans wrote those non-simplified Chinese words in the best calligraphic style he/she could muster. The best and the clearest was the last one, perhaps representing a gradual improvement in Korean education. I am surprised that up to the 50s the Koreans were still using the Chinese characters for such auspicious occasions as the founding or setting up ('Chuang Li') of Song Moo Kwan, which the Koreans may have pronounced "Song" as "Chung" (hence Chung Do Kwan) which is also the Cantonese pronunciation of the pine tree. The pine tree has some cultural significance in China (see all those Chinese black & white ink paintings where pine trees grew out of high barren rock cliff faces?) It shows fortitude and courage, qualities which the founding fathers of Song Moo Kwan obviously wanted to instill in the "Green Wave"
Green Wave ("Qing Tao") when read together in this context most likely means an 'Eternal Youth Movement' (a 'wave' so to speak) as both characters have respectively 'young & longevity' radicals in them. 'Qing' also has the meaning of young crops and so we have the idea of planting the seeds of future greatness in these Korean youths that will eventually and eternally grow into manhood achieving great things. The word you had problem with is the word before "Cha" (to investigate/examine) It is "Shen" -- also having the meaning of 'to examine as in a court of law' Read together in this context it simply means a grading test. "Ji Nian" in this context simply means a commemoration ceremony. Ji = to remember; Nian = to think of in remembrance. " I was suprised by the word "Green". I was expecting Blue wave. 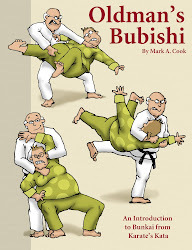 I have read that Funikoshis's "Shotokan" could be translated as Pine Wave Hall or school. In " Karate do My Way of Life" he spoke of the pine trees in his native Okinawa. I later asked Tashigae about the color question. This was his reply..
‘Qing’ should actually be translated as ‘dark bluish green’. I’ve seen it translated as ‘green’, ‘black’ and ‘blue’ depending on the circumstances, although ‘green’ remains the most common one. 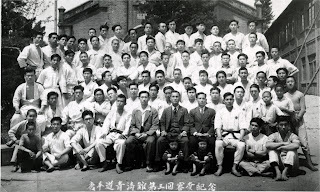 ButterflyPalm's comment about the founding of the Song Moo Kwan was also in regard to another photograph. Both Won Kuk Lee and Yong Taek Chung were present in the photo commemorating the opening of that Kwan. I've visited your site some months ago, but time is tyrant, we know. 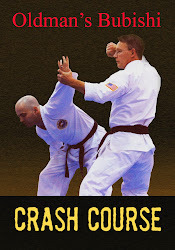 I've started Chung Do Kwan with SBN Han Chang Kim in 1968 in Buenos Aires (previously studied first Japanese and afterwards okinawan karate)so appreciate so much the picture you have shared in the path of truth or research. Thank you for this precious gift! "Tang Shou Tao - Ching (o Qing) Tao Kwan (or Guan)- second (annual?) testing - souvenir picture - 1954, 06, 06.